Over the next few weeks, I want to do a series of posts in which we “re-examine” some familiar verses of the Bible. 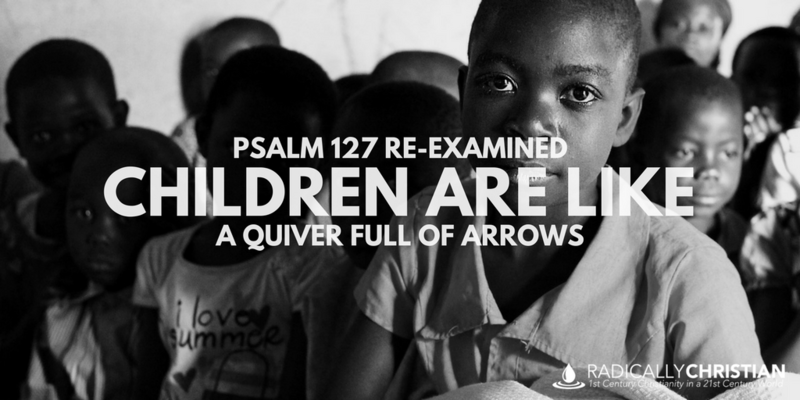 Today we will consider Psalm 127:3-5, “Behold, children are a heritage from the Lord, the fruit of the womb a reward. Like arrows in the hand of a warrior are the children of one’s youth. Blessed is the man who fills his quiver with them!” Christian parenting experts love to quote this passage, but often miss the real meaning of the passage. I’ve heard multiple parenting experts stretch and stretch the metaphor of children being like “arrows in the hand of a warrior.” They suppose this means children, like arrows, were created to be launched out into the world. They believe this passage implies that children are not supposed to stay connected to their parents, but rather are supposed to be shot out into the world like an arrow shot from a bow. Never considering for a moment that this metaphor might point to a different truth, parenting experts spend pages and pages saying it is a biblical mandate to take careful aim and launch children out on their own. In our culture, we believe young people should move away from home and “discover” themselves. We think they need a clean break from mom and dad. We don’t think parents should arrange their children’s marriages or continue to influence them when they become adults. But the way communities, economies, and families worked in ancient Israel and the way they work today are very different. Consider the biblical families with which you are familiar. Sons would become hardworking adult men, take wives, and have children, but they typically did not move away from their father’s property or influence. They stayed to help and support the family. Whether in the days of the patriarchs or the days of the kings, families typically stuck together. In fact, much of the Law required families to remain in close proximity. The land in Israel was parceled out to tribes and families. If a family member fell on hard times and had to sell his property, close relatives needed to be close by to redeem the land for their kinsman. If a brother died without leaving a child, the brother would marry the widow so that the brother’s heritage would not be cut off. Much of the world still operates in a similar fashion. Can you imagine how ridiculous it would be to tell a poor villager in some other part of the world that he is supposed to send his children away once they reach adulthood? Can you imagine telling him, children shouldn’t be expected to stay and help the family, but should be encouraged to go and find their own independent path? While our modern American way of thinking may not be sinful, it is definitely shaped more by culture than Scripture. These two psalms are songs of ascent; songs the Jews probably sang on their annual trips up to Jerusalem. These two psalms remind people that God provides for those who fear Him. They call people to put their trust in the Lord, rather than trusting in the work of their own hands. You might sum up the psalms this way: It doesn’t matter how hard you work, if you don’t fear the Lord, all your labor will be in vain; but those who fear the Lord will be made prosperous and secure. Although the Hebrew word, “ben” in this passage certainly can mean “children,” it literally means, “sons.” That is probably more accurate in this case. The psalmist says a man’s “sons” are given to him by the Lord, and they are like arrows in his hand or in his quiver. He concludes the metaphor by telling us why sons are like arrows. A father with many sons, “shall not be put to shame when he speaks with his enemies in the gate” (Psalm 127:5). In that day and age, sons meant security. When you faced your enemies in the gate, whether in a legal or a military dispute, many sons ensured that you would not be “put to shame.” Having many sons would be like a warrior having many arrows for his protection and defense. But again, the emphasis is not on the fact that security and safety come from sons in and of themselves. Safety and security come from the Lord, since sons, “are a heritage from the Lord, the fruit of the womb a reward” (Psalm 127:3). This doesn’t necessarily mean children have to stay in their hometown or not go off and live their own lives. 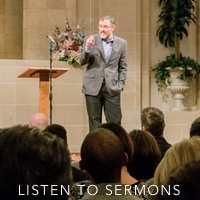 Although, if an adult child gets too disconnected from their parents, and does not provide for their parents’ welfare, they have “denied the faith” and are “worse than an unbeliever” (1 Timothy 5:8). We don’t have to pretend we still live in ancient Israel, but we must make sure we don’t fail to honor our parents because of our American customs and traditions (Matthew 15:1-9). All that being said, the application of Psalm 127 is pretty simple and powerful: You can wear yourself out with your career, your kids, or anything else — but if the Lord isn’t at the center of everything you do, it will all be for nothing. So, fear the Lord and He will bless you. And, of course, we know that in Christ the blessings are even sweeter.